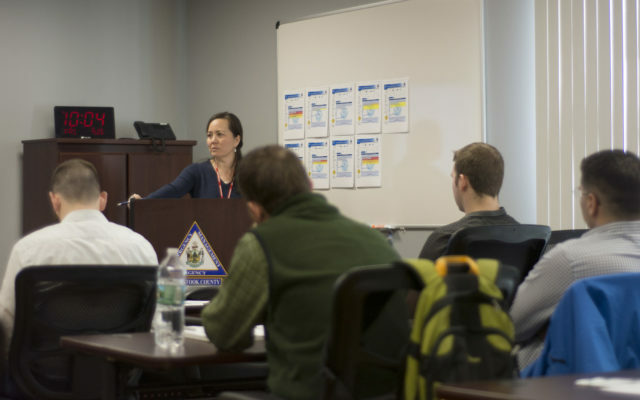 Krauss was among the commission members from the National Weather Service, Maine Department of Environmental Protection and U.S. Geological Survey who met at the Aroostook Emergency Management Office in Caribou to discuss the potential flood threat, which remains greater in Aroostook County where more than 150 inches of snow fell this season. Some 2 to 3 feet is still on the ground in parts of The County. Donald Dumont of the Caribou National Weather Service told the group Friday that there is no significant threat to flooding over the next seven days, and that every single night in the northern part of the state is predicted to be below freezing. He said rapid snow melt problems typically occur when nighttime temperatures are above freezing. “It’s been a controlled snow melt so far, and temperatures will remain below freezing at night, which helps with that controlled melt,” Dumont said. As a result of the anticipated temperatures, the meteorologist said that ice-out is not expected to occur on the St. John or Aroostook rivers over the next seven days. However, there is a “strong possibility” that northern Maine watersheds will gain SWE (snow water equivalent) next week. If the forecasts begin to trend warmer and more rain than anticipated falls next week, he said, the flood threat will increase due to the rain and snowmelt process. Nick Stasulis of the USGS office out of Augusta told the assembly that snow melt is causing statewide flow in rivers to increase overall and remain higher than normal. When rivers start rising, the water levels can quickly fluctuate, Stasulis said, pointing out how the Little Madawaska River in Caribou rose a couple of feet on March 31 and then dropped three feet within a couple hours. Bob Marvinney, state geologist at the Maine Geological Survey discussed snow survey data and what it says about the snowpack. In northern Maine, Marvinney said the snowpack shows about seven to eight inches of water equivalent, whereas the coastal part of the state only has a few inches and areas of southern Maine are already clear of snow. Aroostook EMA Director Darren Woods spoke about the organization’s collaboration with agency partner communities, the Maine Warden Service, local and state police, the Maine DEP, and other organizations to properly prepare in case The County is hit with a serious flood. He said the Maine Warden Service keeps in touch weekly and that the Maine Forest Service has helped his organization with preparedness exercises. — It is never safe to drive down a flooded roadway, as the road may be washed out underneath and it only take as few as six inches of water to cause you to lose control of your vehicle. — Take steps to protect your belongings ahead of time, including elevating electronic devices and moving vehicles out of areas that may flood. — Homeowners insurance typically doesn’t cover flood damage. Check with your insurance company to see if it makes sense to add flood insurance to your policy. It takes 30 days to become effective. — Be aware of flood alerts and warnings by downloading the free Federal Emergency Management Agency app on your smartphone and selecting alerts for up to five locations of your choice.